The Philadelphia artist takes over MASS MoCA with the immersive neon-lit installation "Free Roses" and a contemporary spin on Pop art interiors. 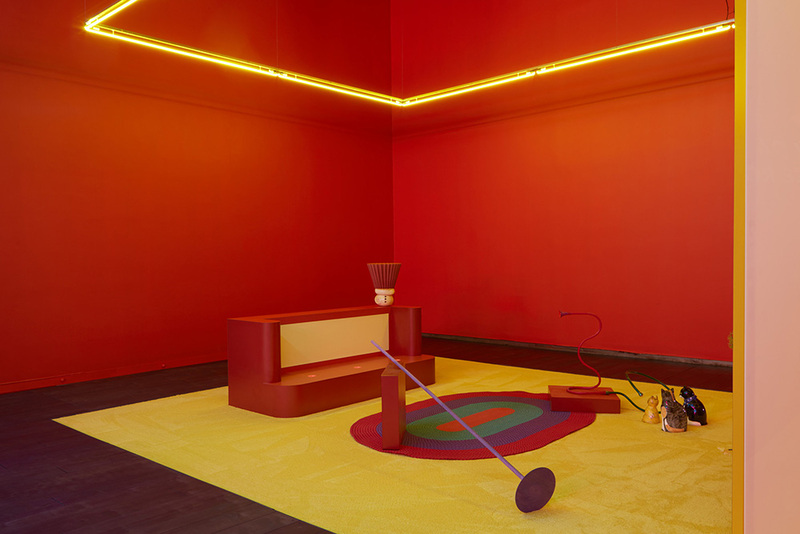 The MASS MoCA exhibition Free Roses is the first museum survey of the work of Alex Da Corte, an artist who has burst onto the scene with otherworldly installations that bring together art history, movie references, and everyday kitsch into bold interiors. In his largest showing ever, Da Corte presents a retrospective of recent works plus the new installation "Lightning," seen here. The piece takes its name from—and surrounds—the Joseph Beuys's sculpture Lightning with Stag in its Glare, the black piece in the midground of this photo. Like much of his recent work, the show references the hallucinatory sensation described in Author Rimbaud's prose poem A Season in Hell. Da Corte plays up this sense of the uncanny by incorporating conspicuously artificial elements from sets and stages, like the disembodied facade seen here, as well as strangely familiar objects that simultaneously provide cultural touchstones and confound. Older works, like the installation Lattice Hypnagogia (Scene One), 2014, and the video Chelsea Hotel No. 2, 2010, complement the new installation. Here, the name of the elaborately embellished, high-gloss room cites the transitional stage between sleep and waking. Da Corte's work tends to unfold like a choose-your-own-adventure exploration as viewers encounter a series of vibrantly-colored rooms and experiences. Here, two pieces from 2015, Siren (After E.K. Charter) and Untitled (Balls and Spray), hang within the 2007 installation After Party. Alex Da Corte: Free Roses runs through January 2017 at MASS MoCA, North Adams, Massachusetts.